Till the beginning of 2000, ERP was considered as a software for big organizations having the capability to “afford” it – in terms of money as well as capable business users and supporting IT team. ERP majorly mattered to two far ends of the organization. One end being data entry operators who would typically enter the masters, create orders and enter production data (at the end of the shifts) and other end being the management who would review its summary during review meetings. ERP systems were considered a something that belonged to the IT department (called as EDP then). From selection of ERP to implementation to maintain – all through it was IT department’s responsibility. Business teams, be it sales, purchase or production was to “concentrate” on their Business by any means not necessarily ERPs. This was till the end of the first decade of the year 2000. Globally the trend started to change with the advent of automatic machines capable of churning good production volume in lesser time. This happened across the industries and Textile and Apparel was no exception. The global giants started to create industry-specific ERPs or at least versions or modules for the Textile and Apparel Industry. Today Apparel manufacturers have realized that having an ERP is as basic as fabric for garments. Factors like customer’s need for process and documentation uniformity in the sourcing, quality and production pushed manufacturers to look out for ERPs. Better compute power from server manufacturers, better internet connectivity from telecoms and better availability of technology components helped the new breed of ERPs which are light on pockets and maintenance. This has resulted into a greater adoption of ERP by all sectors – be it a vertically integrated unit or a standalone garment washing unit. There had also been a trend to seek everything from one single ERP and making it one for all solution. But today that is changed. Leading apparel organizations opt for ERPs that are capable to “communicate” with other systems be it software or PLCs or internet. They are aware that if they provide the most suitable platform for each team, the overall productivity of the organization is greatly improved. The fear of integrating multiple solutions is now fading away with the advent of service-oriented architectures, web services, and APIs. All the advancement has resulted into organizations capable to deliver smaller orders with complex styling in shorter delivery time across the globe. The customer can enter an order in Customer ERP and that automatically creates a garment order in manufacturer’s ERP along with fabric and trim order passed to the nominated supplier with predefined delivery dates. The ERP at the manufactures end then creates raw material and production requirement which is supplied by the supplier using ASN (advanced shipping note) those are just scanned when received in the warehouse. Using RFID, fabric warehouse picks up the lot assigned to an order and delivers to the cutting table. The sewing or finishing operator need not worry of “entering” production data as that’s taken care by Barcodes or RFID integration. The ERP keeps a track of production, raises alarms on delays and ensures the timely shipment of the order. Today Industry, in general, is gearing up for Industry 4.0 which largely is a combination of the seamlessly connected network of ERP, portals, machines, mobiles deployed over the internet. It sure is going to be interesting to see how the Textile and Apparel industry adapts and gets benefited from it..! For an example, the Datatex ERP product suite helps apparel manufacturing organizations manage complex planning and scheduling requirements in the Cutting, Sewing and Finishing departments. The shop floor data collection systems help the production teams record the activities efficiently. 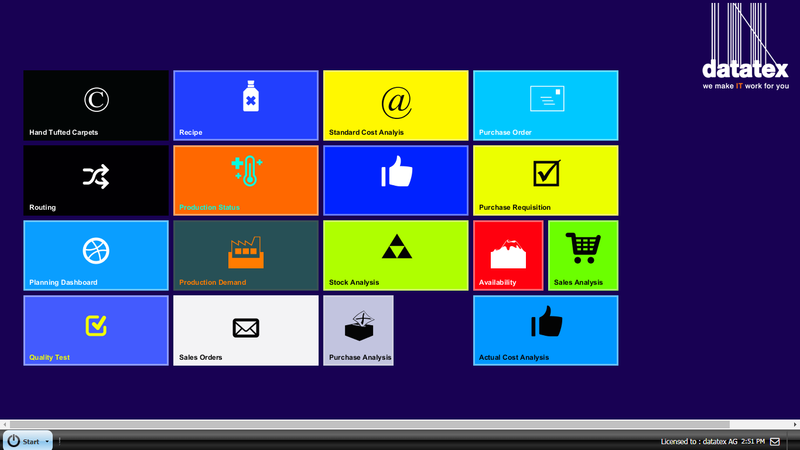 Check the list of some of the well-known apparel ERP systems. About the Author: Rahul Mahajan, has been actively working with Textile and Apparel manufacturing industry since 2000. He has implemented ERP and planning solutions in India and SEA countries. Rahul’s area of interest is IT solutions for the Fashion vertical ranging from PDM, ERP, Planning, Warehousing, Shop floor systems to Automation. The changes and development in the apparel ERP systems happened in recent years. Learn about the trends in ERP implementation and ERP selection procedure.